Genesis 33:17 Jacob traveled to Succoth, built himself a house, and made shelters for his livestock. Therefore the name of the place is called Succoth. Joshua 13:27 and in the valley, Beth Haram, Beth Nimrah, Succoth, and Zaphon, the rest of the kingdom of Sihon king of Heshbon, the Jordan's bank, to the uttermost part of the sea of Chinnereth beyond the Jordan eastward. Judges 8:6 The princes of Succoth said, "Are the hands of Zebah and Zalmunna now in your hand, that we should give bread to your army?" Judges 8:8 He went up there to Penuel, and spoke to them in like manner; and the men of Penuel answered him as the men of Succoth had answered. Judges 8:14 He caught a young man of the men of Succoth, and inquired of him: and he described for him the princes of Succoth, and its elders, seventy-seven men. Judges 8:15 He came to the men of Succoth, and said, "See Zebah and Zalmunna, concerning whom you taunted me, saying,'Are the hands of Zebah and Zalmunna now in your hand, that we should give bread to your men who are weary?'" Judges 8:16 He took the elders of the city, and thorns of the wilderness and briers, and with them he taught the men of Succoth. 1 Kings 7:46 In the plain of the Jordan did the king cast them, in the clay ground between Succoth and Zarethan. 2 Chronicles 4:17 In the plain of the Jordan did the king cast them, in the clay ground between Succoth and Zeredah. suk'-oth, suk'-oth (cukkoth, "booths"; Skenai, Sokchoth, etc. ): After parting with Esau, Jacob journeyed to Succoth, a name which he gave to the place from the "booths" which he erected to shelter his cattle (Genesis 33:17). It was in the territory of Gad, and is mentioned with Beth-nimrah (Joshua 13:27). In his pursuit of Zeba and Zalmunnah, Gideon seems to have retraced the path followed by Jacob, passing Succoth before Penuel (Judges 8:5). Their churlishness on that occasion brought dire punishment upon the men of Succoth. Gideon on his return "taught them" with thorns and briers (Judges 8:16). In the soil of the valley between Succoth and Zarethan, which was suitable for the purpose, the brass castings of the furniture for Solomon's Temple were made (1 Kings 7:46 2 Chronicles 4:17). Jerome (on Genesis 33:17) says that in his day it was a city beyond Jordan in the district of Scythopolis. From the above data it is clear that Succoth lay on the East of the Jordan and North of the Jabbok. From Psalm 60:6; Psalm 108:7, we may infer that it was close to the Jordan valley, part of which was apparently known by its name. Neubauer (Geog. du Talmud, 248) gives the Talmudic name as Tar`ala. Merrill (East of the Jordan, 386) and others compare this with Tell Deir `Alla, the name of an artificial mound about a mile North of the Jabbok, on the edge of the valley, fully 4 miles East of the Jordan. There is a place called Sakut West of the Jordan, about 10 miles South of Beisan. This has been proposed by some; but it is evident that Succoth lay East of the river. No trace of the name has been found here. (cukkoth; Sokchoth (Exodus 12:37; Exodus 13:20 Numbers 33:5)): The first station of the Hebrews on leaving Rameses (see EXODUS). The word means "booths." The distance from ETHAM (which see) suggests that the site may have lain in the lower part of Wady Tumeilat, but the exact position is unknown. This region seems possibly to have been called T-K-u by the Egyptians (see PITHOM). Brugsch and other scholars suppose this term to have been changed to Succoth by the Old Testament writer, but this is very doubtful, Succoth being a common Hebrew word, while T-K-u is Egyptian The Hebrew "c" does not appear ever to be rendered by "t" in Egyptian. The capital of the Sethroitic nome was called T-K-t (Pierret, Vocab. hieroglyph., 697), and this word means "bread." If the region of T-K-u was near this town, it would seem to have lain on the shore road from Edom to Zoan, in which case it could not be the Succoth of the Exodus. SUCCOTH, a place in the valley of Jordan in the tribe-district of Gad e. of Jordan. Perhaps at a tell Darala since the Talmud calls Succoth, Darala, and Dr. Merrill has discovered the latter place 1 mile n. of the Jabbok. The other place bearing the same name, Succoth, was in Egypt and is probably that district around Pithom, discovered (1883) by Naville, just 10 ms. w. of Lake Timsah at a place called tell Mashuta on the ancient canal. 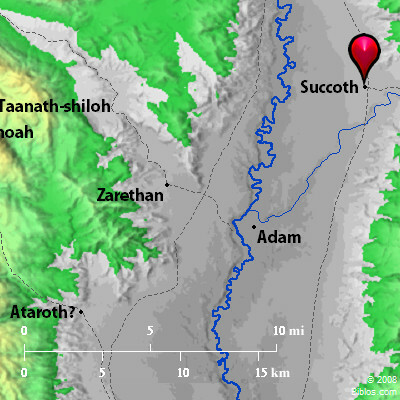 The region around Pithom was Succoth. See Pithom.